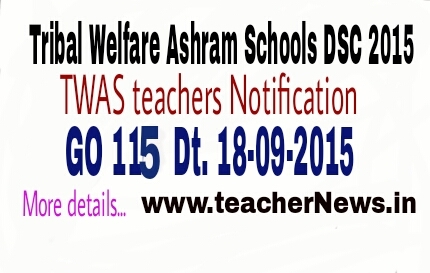 Andra Pradesh Tribal Welfare Ashram Schools Department invite to Vacancies fillup TWAS Teachers posts asper GO 115 ,Dt. 18-09-2015 Total number of post / jobs 314 full up very soon School Assistants , Language Pandits Telugu , LP Hindi , SGT ,PET and Craft Teachers Recruitments. 1. G.O.Ms.No.276, Finance (SMPC) Department, dt.09-08-2010. 2. G.O.Ms.No.45, Social Welfare (TW.SER.III/A1) Department, dt:28.06.2011. 3. G.O.Rt.No.554, Social Welfare (TW.Ser.III) Department, dt.15-07-2011. 4. G.O.Rt.No.887, Social Welfare (TW.Ser.III) Department, dt.03-11-2011. 6. Tribal Welfare Department’s U.O.No.9971/ TW.Edn.1/2014, dt:06.01.2015. 1.In the reference first read above, orders were issued sanctioning 2,151 posts of teachers in various categories in the Tribal Welfare Ashram Schools under the control of Tribal Welfare Department. 2. In 5th read above, the Social Welfare Department has issued orders to fill up five hundred and fifty nine (559) vacancies of Teacher posts in Ashram Schools of Tribal Welfare Department in Non-Agency (Plain) areas, in the ensuing DSC-2013 Notification. 3. The Tribal Welfare Department has informed that the DSC 2013 was not taken up. After bifurcation (314) posts pertains to residuary State of Andhra Pradesh. 4. After careful examination of the proposal of the department and keeping in view the actual requirement and the overall financial implications, the Government hereby accord permission to the Tribal Welfare Department to fill three hundred and fourteen (314) vacant posts of teachers in Tribal Welfare Ashram Schools located in Non-Agency (Plain) areas of Andhra Pradesh as per the Service Rules governing teachers working in Tribal Welfare Ashram Schools. 5. The Tribal Welfare Secretariat Department and the Commissioner of Tribal Welfare Department shall take necessary action for filling the respective posts duly following the relevant rules applicable to direct recruitment to Ashram Schools and constituting the District Selection Committees as per the existing Rules. 6. The Tribal Welfare Department shall issue detailed guidelines regarding the recruitment process.